The impromptu lunch invitation. It’s so thoughtful and polite. I appreciate it a great deal. But being a brown-bagger, I awkwardly stammer on about how I brought my own lunch and hold up my reusable lunch tote as proof. I’m positive that I give this exchange infinitely more thought than the people who flit past me on their way to myriad fast food places. I usually leave the encounter feeling a bit guilty. But by the end of my lunch break, I land pretty solidly in the sorry-not-sorry field. I save money. If eating out costs between $5-$15/day, that’s a possible extra $75 a week I’d be spending. I like Panera, but I don’t like it that much. I eat healthier. Perhaps it’s because I eat out so infrequently during the day, but I tend to treat meals out as “last meals.” I don’t drink Diet Coke, but I’ll take an extra large. I try not to eat sweets, but I better get a cookie. Those vegetables look awfully healthy, I think I’ll take a pass on them today. I’m indecisive. I hate being the person who chooses where to eat. I like routines. I eat the same thing for breakfast and essentially the same thing for lunch every day. It might be boring, but it saves me time and frees up my thoughts for things that matter. I hate hunting down parking. I get to work really early. Mostly to get things done, but also because I hate circling for parking. One time I went out during lunch and had to walk two blocks back to school since the lot was full. No, thanks. I prefer to spend my time doing other things. If I’m at work, I do lunch duty. It’s a prime opportunity to bond with students, and it’s also a teacher-approved side hustle. If I happen to have an forty-minute lunch break, I’m all about running photocopies, lesson planning, grading, or reading a book. I find other ways to socialize. Lest you think I’m an antisocial monster, some of my favorite coworkers are cafeteria supervisors as well. If I’m not doing lunch duty, I can always go hang out in the teachers’ lounge. *If you think I’m boring or PB&J is gross, you’re in good company. It’s pragmatically unanimous among the students. Though, they gobble down the mystery taco bowls, so what do they know? So Tell Me…Do you bring your lunch every day? Do you turn down requests to eat out as awkwardly as I do? I bring lunch to work almost every day for the reasons you mentioned. We do have a caf at work but at $7-10 per lunch depending on what you get, the cost can really add up fast. I bring my lunch to work everyday now and I love it for all the reasons you highlight. Most of my co-workers bring lunch, so there is enough support for the idea that it’s less awkward now. ? I’m so happy for you that your coworkers have joined in. It makes it so much easier! I brown bag it, too, but I do struggle to say no when I am asked to go out, because of the social aspect. I did find that people are often willing to eat packed lunches with you if you say you’re saving money and making advance plans. Usually, for me, the invitation comes when the person has forgotten their lunch, so it doesn’t work. We don’t have to drive to food, though. It’s directly across the street. PREACH. 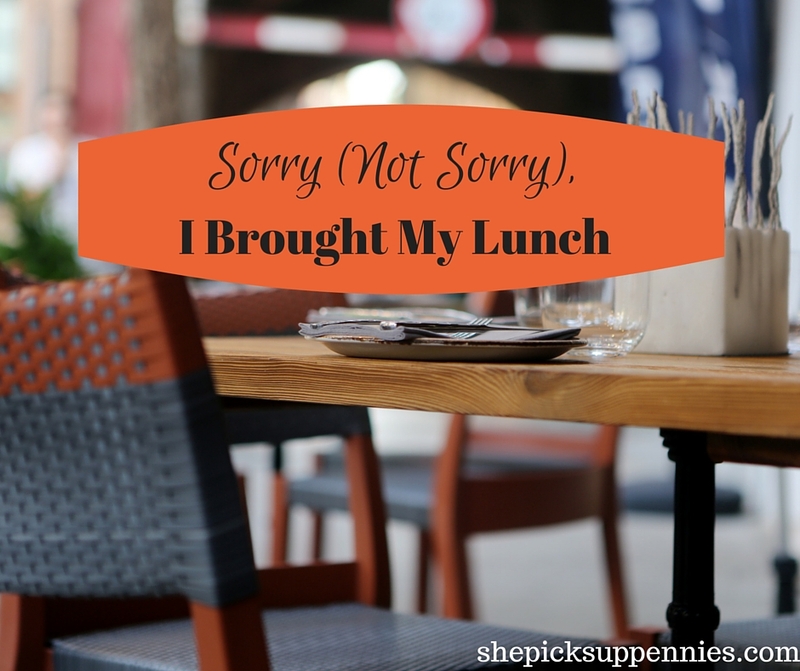 I bring my lunch almost every day, and it’s almost always leftovers or a homemade salad or sandwich. Saves me time and money, and I can eat it while catching up on blogs instead of waiting in line at a restaurant. Oh my gosh, yes! You’re so right, Piggy. We only have 35 minutes for lunch, so I never really understand the point of driving somewhere and then waiting around! I bring my lunch as well and sometimes when people ask and I say I brought lunch they ask are you sure you don’t want to come? I just said I brought lunch! I don’t think I could be clearer about what I’m eating but I try and be polite because I don’t like eating lunch out. There aren’t very good food options by my office and anything I bring is much tastier anyway.